NAHA, OKINAWA PREF. - The central and Okinawa Prefectural governments kicked off talks on Wednesday to break an impasse over a plan to build a new U.S. military base within the prefecture to replace U.S. Marine Corps Air Station Futenma. Hours before the “intensive consultations” started on the replacement for the Futenma base, a U.S. military helicopter crash landed aboard a ship off Okinawa’s main island, sparking anger among local citizens already concerned about the risks Okinawa faces by hosting the bulk of U.S. military installations in Japan. 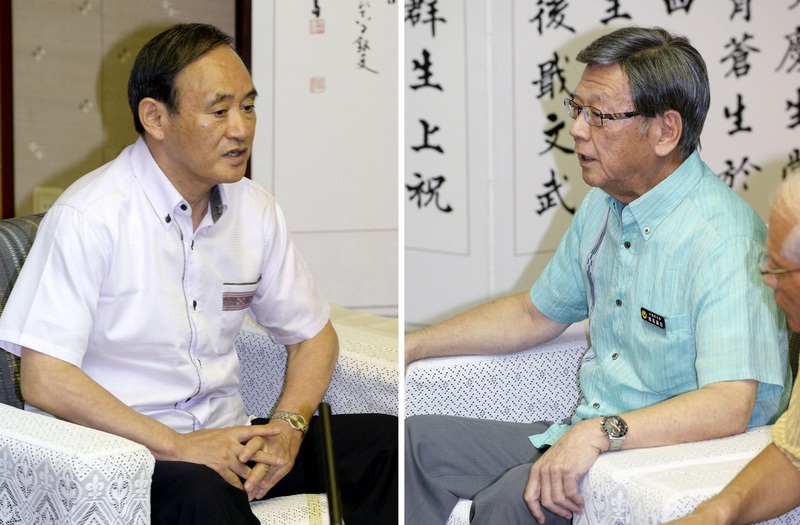 The consultations, to be held once a week or roughly five times through Sept. 9, began with a meeting between Chief Cabinet Secretary Yoshihide Suga and Okinawa Gov. Takeshi Onaga. The current plan calls for the base to be moved from a densely populated area in Ginowan to the less populated Henoko district of Nago. However, Onaga was elected last fall on a platform opposing the plan. He argues Futenma base should be moved outside of the prefecture. 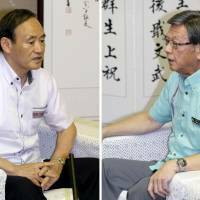 But their differences soon became apparent during the one-hour meeting, with Suga calling for the need to implement the existing base transfer plan to remove the “danger” of keeping the air station at the center of a crowded residential area. Suga also the starting point of their discussions should be the 1996 agreement between Washington and Tokyo on the return of the Futenma base site to Japanese control. Onaga disagreed, saying the starting point should be the seizure of Okinawan land by the U.S. military for its bases when the region was under U.S. control for decades after World War II. The governor also expressed concerns regarding the helicopter mishap and pointed to the importance of reducing the burden on Okinawa of hosting U.S. bases. “A disastrous thing could happen to people living close to the bases,” he said. After the meeting, Suga admitted that he felt a large chasm between the two sides, but vowed to make efforts to “deepen understanding” through future rounds of consultations. The meetings are being held following the central government’s announcement on Aug. 4 that it would suspend work related to the planned Henoko airstrip for a month as part of efforts to defuse tensions with local authorities. The central and prefectural governments have been at loggerheads since Onaga became governor in December. Onaga has considered rescinding his predecessor’s approval of landfill work off Henoko to build the coastal replacement facility. But he has put off a decision on the matter while the central government puts the relocation work on hold for the talks. Tokyo argues that relocating Futenma’s operations to Henoko is the “only solution” for removing the dangers posed by the air station without undermining the deterrent effect of the Japan-U.S. alliance, amid increasing tensions in East Asia. Some citizens opposed to the transfer of the Futenma operations said Wednesday the latest U.S. military helicopter accident shows there are too many bases in Okinawa. Hiroshi Ashitomi, co-leader of a civic group opposing the relocation plan, was sarcastic about the timing of the crash. “Maybe the U.S. forces tried to demonstrate the danger of having bases concentrated in Okinawa, given that the chief Cabinet secretary is visiting here now, ” Ashitomi said. The next round of consultations between the central and local governments is expected to be held next week in Tokyo, with Onaga likely to join a meeting of Cabinet ministers involved with the issue.